Picture at left is Lieutenant Edward in 1885 (US Naval Historical Centre Photoraph). Edward Qualtrough is seated front riight of centre. Alumni Class at the U.S. Naval Academy 1871. Permission granted to use the picture from the U.S. Naval Archive Library, Annapolis, Maryland. It seems that nothing stops a Qualtrough from achieving. And Edward Francis QUALTROUGH of the USA was one such a person. Qualtrough, Edward Francis (sometimes Frank) was born on October 30, 1850 in Rochester, New York, United States. Son of Joseph and Elizabeth (Gibson) Qualtrough. There was a little confusion about his age. Naval sources say 1850, yet if he was 18 in 1870 (see below) so that would mean he would have been born about 1852. He was the son of Joseph Qualtrough (born 1825 in Rushen Isle of Man, died 22 February 1898, in Rochester). Joseph was a prominent miller in Rochester, an alderman in the 1860’s and an overseer of the poor. There were many other Qualtroughs in Rochester, but that is another story. It would seem that Joseph was the son of William Qualtrough, late coroner and widow of Rushen, Isle of Man, who married Miss Elizabeth Qualtrough, spinster, daughter of Mr Thomas Qualtrough of Kentraugh, Rushen, IOM, in 1823. This is still to be established however. Now let us return to Edward. At age 18, in 1870, he was a midshipman and studying at the Annapolis Naval Academy in Maryland. He graduated in the Class of 1871. He must have been a man of ambition because in a few short years he was holding sway in Naval and Governmental circles. We hear of him again on May 6, 1883, when a total eclipse of the sun was visible from Caroline Island in the Pacific Ocean. It was observed by a party of American astronomers, headed by Edward S. Holden, and two British observers. They were transported from Callao, Peru, to the island on the U.S.S. Hartford, arriving April 21, 1883. A French expedition also observed this eclipse. A map of the island was made by Lieutenant E.F. Qualtrough, U.S.N., and natural history specimens were collected by Dr. W.S. Dixon, both of the U.S.S. Hartford. Insects were collected by Dr. Palisa of the French expedition. Not only did he have ambitions in the Navy, he also was a natural writer and he used these abilities to air his opinions. In 1889 he wrote a persuasive article for the OVERLAND MONTHLY magazine, published out of San Francisco, about "Our Naval Necessities" and in it expressed his very strong argument for a strong and independent naval defence force for the United States. He mentioned his concern about the lack of coastal defence in the time of war especially along the Pacific Coast, and hoped that the US Government would consider spending large sums of money to rectify this. Edward F Qualtrough must have also had a love of recreational sailing as he contributed three manuals, which became stalwarts of the yachting fraternity as well as in commercial areas of sailing ships. The first of these was THE SAILOR’S HANDY BOOK AND YACHTSMAN’S MANUAL –adapted for the use of the navy, merchant marine and yachtsman.. This was published in 1881. 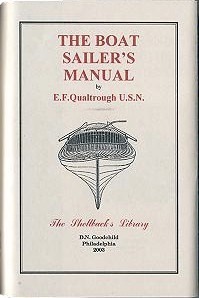 He also wrote two others – THE BOAT SAILOR’S MANUAL (pub 1886) and what appears to be an update to this in 1889. In 1874 he was promoted toensign; Master in 1876; Lieutenant, 1883 and Lieutenant commander, 1899. He obtained the rank of Commander, 1902; Captain, July 1, 1906. He retired as Commodore in 1909. In the late 1890’s Edward’s (and I am sure from others within the Navy also) earlier enthusiastic push for stronger naval coastal defence for the US began to bear fruit. The government of the day allocated large sums of money to building many naval ships of various capabilities. He served in various capacities on board Macedonian, Savannah, Wabash, Wauchusett, Despatch, Marion, Trenton, Gettysburgh, Hartford, Charleston, Mohican, Terror, Chicago, 1871-1902. As Captain he served on the USS Atlanta, USS Cleveland and then the USS Georgia from Jun 4 1908 to Dec 21 1909. In 1907, as a result of the expansion of naval capacity and strength, the GREAT WHITE FLEET began its tour around the world calling on many international ports in the interests of good will. The tour was to take fifteen months. The Fleet left Hampton Roads, Virginia, in review before President Theodore Roosevelt, on 16 December 1907 and headed to Cuba and then down the coast of South America, visiting several countries on their highly successful cruise. Rounding Cape Horn, the Fleet, comprising of some 16 battleships. gradually made its way up the Pacific coast of the Americas. It met with ships of the Pacific Fleet in another review in San Francisco for the Secretary of the Navy on 8 May 1908. USS GEORGIA was 435 feet in length with a displacement of 14,948 tons. Its speed was 19.26 knots. 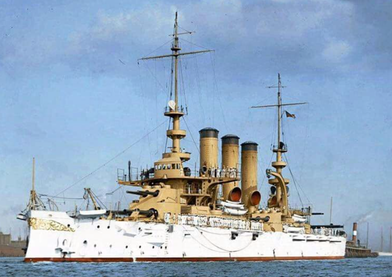 It carried a complement of 40 officers and 772 men and was built in Bath, Maine Launch date was 11 October 1904. In 1907 it arrived at Hampton Roads and was attached to the 2nd Division of the Great White Fleet, which comprised of 4 Divisions. 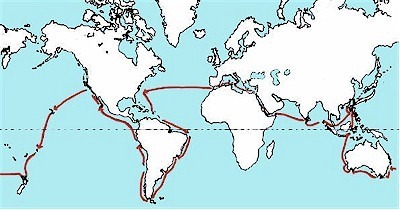 The Fleet left San Francisco on the second leg of the world tour on 7 July 1908, showing the US flag and bringing the message of American sea power to many parts of the world, including the Philippines, New Zealand, Australia, Japan, Ceylon (Sri Lanka) and Mediterranean ports. Captain Edward Qualtrough was a Divisional Commander in command of the USS Georgia till the Fleet reached Gibraltar, in all 7 months. The trip must have been a wonderful opportunity for many a young sailor and I am sure that even the ship’s officers would have also had impressions left upon them of this time. The tour of duty took them to Honolulu , (July 16 – 23 1908)and then the Fleet sailed on to Auckland, New Zealand, (August 8-15 1908). Such a huge flotilla of naval steel sailing into Auckland harbour must have been an impressive sight. Also such a large complement of US naval personnel arriving in such a young British Colony, by now a Dominion, must have also had some repercussions! They paraded down Auckland’s Queen Street, and I am sure were feted well during their week’s visit. 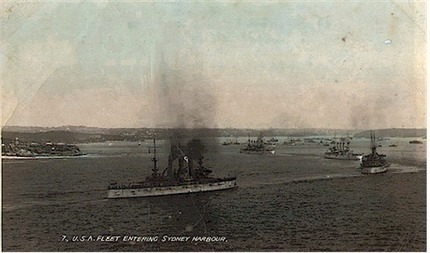 The Fleet then sailed on to Australia, entering Sydney Harbour on 20 August 1908 where they remained for a week. A Naval Parade was held in Sydney on 23 August 1908. The Fleet arrived in Melbourne on 29 August and remained till 5 September when most of the Fleet sailed for Albany, West Australia. Albany was important coaling stop for the Fleet. During the second leg of the voyage when Captain Edward F. Qualtrough was Commander of the USS GEORGIA and the 2nd Division. It was then on to Colombo, Ceylon (Sri Lanka), Port Said and the Suez Canal and then a variety of Mediterranean ports before assembling at the British Naval Port of Gibraltar. It was here on 5 February 1909 that Divisional Commander Edward Francis QUALTROUGH was relieved of his command. He returned to the United States and retired from the Navy on 30 June 1909. 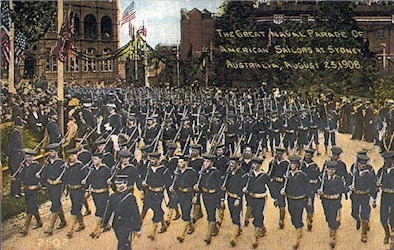 The Great Naval Parade of American Soldiers in Sydney, Australia, 23 August 1908. Capatain Edward F. Qualtrough, who took to Georgia on World Trip and was out-martialled for intoxication at Tangier, Among those to go - Lieutenant Commanders make up nine. Five captains and one commander, and three liertenant commanders of the envy, the selection of the Sperry “plucking board,” yesterday were retired under the navy personnel act after approval by President Taft. They include Capt. Edward F. Qualtrough who was commander of the battleship Georgia furing the trip around the world of the Atlantic fleet and was suspended from duty for six months following a court-martial at Tangier on charges of intoxication and unbecoming conduct. The captains were retired on the next higher rank,that of commodore; on June 30; and received three-quarters pay of the higher rank. Edward Francis lived out his retirement in Washington D.C., USA and died on 18 November 1913. From the Washington Post, Nov 20, 1913 - Service for Retired Commodore Will Be Conducted This Afternoon. Funeral services for Commodore Edward F. Qualtrough, U.S.N., retired, who died Tuesday afternoon at his residence, 1714 J Street, will be conducted this afternoon at 2 o’clock in St. John’s P. E. Church by Dr. Roland Cotton Smith. Chaplain Bayard, U.S.N. will officiate at the burial in Arlington. The pallbearers will be Rear Admiral O.F. Stanton, U.S.N., retired; Rear Admiral Charles T. Hutchins, U.S.N., retired; Surg. Gen. Stokes, U.S.N. ; Dr. Alexander Magrudedr, W.R. Merriam, former governor of Missouri; Charles Campbell, and Rear Admiral U.R. Harris. Commodore Qualtrough is survived by his wife, who before her marriage was Miss Lelia Ray, a member of one of Washington’s oldest and most distinguished families. Commodore Qualtrough was graduated from the Naval Academy in 1871. He commanded the monitor Terror during the spanish War. He was a member of the loyal Legion and the Spanish War Veterans. In 1909 he was retired. Commodore Qualtrough was 63 years old, and a native of Rochester, N.Y.
Qualtrough Street, San Diego features fairly impressively in that anyone going to the area from where the 1995 America’s Cup was raced, or driving to the Southwestern Yacht Club, San Diego has to go down Qualtrough Street. So Edward Francis Qualtrough has left an indelible mark on the naval city of San Diego. In the book A QUOTA OF QUALTROUGHS pp21 and 22 there are references to a Joseph Qualtrough (aka Ambrose Joseph Qualtrough) leaving the Isle of Man and going to the United States to join the U.S.Navy (p 21) and that Ambrose Joseph (Qualtrough) had called in to Auckland with the Great White Fleet in the early 1900’s, missing seeing his relatives who had migrated there (p22). In researching this article no references were found of another Qualtrough officer at part of the Great White Fleet , and this has proven to be so, (See below). It is well known within AJ Q’s branch of the family that he left a wife and daughter of 2 years old in the Isle of Man and went to the USA with the intentions of joining the Navy. The apparent story was that he was never heard of again. (The wife and daughter later emigrated to Wisconsin, USA and descendants still live there. See Chart 23) However this has proven to be false. Meg Turville-Heitz, great-grandaughter of (Ambrose) Joseph Qualtrough has located her grandmother’s, Margaret Olive Qualtrough, diary of a voyage back to the Isle of Man with her mother in 1923, just prior to Margaret’s marriage to Henry (Harry) Lane Turville. Margaret was the 2 year old child Ambrose Joseph Qualtrough had left behind in the Isle of Man. On the journey by train across the USA from Wisconsin to New York to board the ship for the Isle of Man, they stopped off at Cleveland, Ohio. It seems Ambrose Joseph’s desire to experience a life at sea never eventuated. He appears to have died in the 1890’s in Cleveland. As to the New Zealand family missing a connection with their cousin Ambrose Joseph Qualtrough of the Great White Fleet when it visited Auckland in 1908 – it can only be assumed that a confusion existed in names or perhaps as the years went by, long-term memories faded or became embellished. Who knows why the mix up of names? Perhaps that is something we will never know.